Members of the Harrogate Nova Strava Club have had considerably better riding conditions this week with layers of winter weather clothing being cast aside (some members ventured out without over shoes and others in shorts) and the Spring sunshine enjoyed. 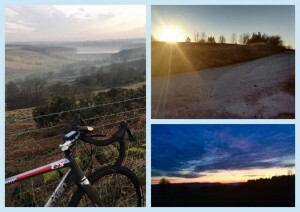 David Jackson, Mike Wilberforce and Rob Beagley have found beautiful sunrises and sunsets whilst out riding this week. The final event of the Magnificent Seven Reliability Rides, the Prologue Café Bash took place on Sunday morning, with a large turnout enjoying the route, and the coffee afterwards. Further afield, Harry Brook-Dobson and Edwyn Oliver-Evans are continuing their exploration of cafés across the south-west. Despite the cake intake over the course of the week, Harry completed the Bath Half Marathon in the excellent time of 1 hour and 24 minutes on Sunday morning. 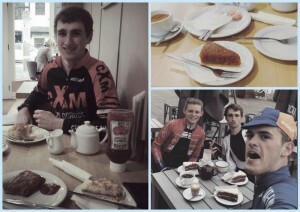 While Ed headed to Devon to take part in the Modbury Road Race (results awaited). Duncan Mullier and John Tiffany headed to Stokesley to take part in the Cleveland Wheelers “21” Hilly TT on Sunday morning. Unfortunately, last-minute course changes, due to emergency water works, resulted in the loss of three miles and a hill. Official results are still awaited, however, Timetrailling forum reports that Duncan had a strong ride to finish fifth. The Harrogate Nova Open 24 takes place on Saturday 19 March 2016 – a field of 52 will take to the start line, with home club member Rob Senior the first off at 2:01pm.